Explosion In Heart Of Istanbul's Tourist Area Kills At Least 10 : The Two-Way Turkish officials say a suicide bomber identified as a 28-year-old Syrian national targeted tourists. At least eight Germans died in the blast, Chancellor Angela Merkel says. 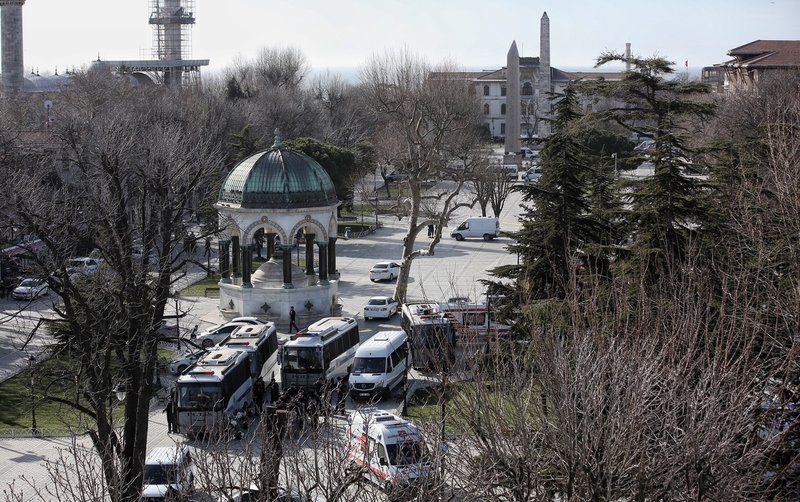 Ambulances and police are seen at the blast site after an explosion in Istanbul's central Sultanahmet district. At least 10 people were killed and 15 wounded in a suicide bombing near tourists in central Istanbul's historic Sultanahmet district. Turkish President Reccep Tayyip Erdogan says police believe the explosion, which reportedly struck near where a 3,500-year-old Egyptian Obelisk of Theodosius stands, was the work of a suicide bomber with ties to Syria. Erdogan delivered a lengthy televised address in the wake of the attack. Confirming and providing new detail about earlier reports, German Chancellor Angela Merkel says eight Germans are among the dead in Istanbul. Both Merkel and German Foreign Minister Frank Walter Steinmeier spoke of the country's losses today, saying that in addition to those killed, nine German nationals were severely injured, reports NPR's Esme Nicholson. "International terror changes the places of its attacks but its goal is always the same — it is our free life in free society," Merkel said, according to the AP. "The terrorists are the enemies of all free people, indeed, the enemies of all humanity, whether in Syria or Turkey, in France or Germany." Most of the people killed were foreigners, says Deputy Prime Minister Numan Kurtulmus, who also said police had identified the bomber as a 28-year-old Syrian national. "We'd come out of the Blue Mosque and were just walking onto this boulevard. We were just in the corner, just out of sight. So we heard it, rather than saw. Then, people were just running in every direction. Some people were running towards the action, to help. And other people were just fleeing.... We were very much caught between a rock and a hard place." Tourists frequently visit the area of the blast, drawn by the green open space and a cluster of historic sites such as the Hagia Sophia and elements of the Hippodrome of Constantinople. Reporting on the nationality of some of the victims, Hurriyet Daily News reports, "Six German citizens, one Norwegian and one Peruvian were among the ... wounded people rushed to the Haseki Hospital, Doğan News Agency has reported." The news outlet adds that in the mayhem that followed the attack, a police vehicle crashed and flipped on its side, its siren still blaring. Video from the scene shows a crowd of onlookers gathered to flip the vehicle back upright. Tuesday's attack is the latest in a string of terrorist activity in Turkey. In October, some 100 people were killed in a double bombing in Ankara. In December, a blast at an Istanbul airport killed one person. And police said they foiled another double bombing in Ankara that was timed to strike on New Year's Eve. "Basically, folks here in Istanbul have been on edge for weeks," Peter says, "wondering if something was going to blow up here."